In 2007 I purchased (what was to become) my best endurance horse. She is a huge black Tennessee Walker mare named Flame with a 25″ overstride when she’s moving at speed. She has been clocked on multiple occasions in her running walk/rack at a whopping 14 mph, covering ground with ease. She is naturally gaited and has never seen a leg chain or stack on her feet. Her breeder and original trainer is also an endurance competitor and this mare was bred specifically to do the job of covering 50+ miles in one day. The first year I competed on Flame, we had nothing but trouble keeping shoes on her feet. She literally would blow them off her feet as she flew over all types of terrain found on an endurance ride. I determined she was not catching them and pulling them off, they were flying off. A Tennessee Walker moves differently from a trotting horse, the feet slide as they hit the ground flat … unlike a trotting horse which will move heel to toe and the foot lands. The concussion of the slide movement was shifting the shoe and within a couple miles of fast gait, the nails would let go and the shoe would fly off. I spent two years trying different types of shoes, with cleats, without cleats, with bars, without bars, with heel caulks, without heel caulks … I even tried aluminum racing shoes used on Thoroughbreds. I tried big nails, little nails, side clips, front clips … Nothing stayed on her feet. At the end of the second season of competition, when we completed 50 miles of the most grueling trail on the east coast at the Old Dominion Endurance in the Shenandoah Valley of Virginia with only one shoe on, and her scores were all A’s, I decided it was time to throw away the shoes. In most cases, when a horse has it’s shoes pulled permanently for the first time, that horse will be sore for a period of time while the horse’s feet adapt to actual contact with the ground. In Flame’s case, she was not sore a single day after I pulled her shoes. I did hours of research into barefoot endurance riders and in all cases I learned that their horses are on 24/7 turnout. This allows the horse to move in complete freedom all day long, simulating the natural life of a wild horse, and stimulating the blood flow into the hoof. I quickly threw her out to pasture and let mother nature take it’s course. I spent a full year of balancing her feet to her way of moving. We shaped, we rasped, we spent hours on trails finding the perfect balance. We did not compete this year, as I was injured and she was nursing a foal, so we had plenty of time to get this barefoot balance figured out. I made mistakes in the beginning, but through diligence and research, I finally achieved correct hoof balance for her and was ready for the 2011 season of competing. Our first two rides were on mostly soft trails so I didn’t bother with any kind of foot protection. She completed two CTR’s (Competitive Trail Rides) perfectly fine with scores in the upper 90’s. The fact that both rides were higher scores than she’d ever received before at a CTR, led me to believe I was on the right track with her feet. At this time, I was rarely taking a rasp to her feet, and mostly to just smooth out a flare. She did not chip or bruise and her feet were wearing evenly all the way around. I wanted to protect her feet on the more grueling trails, so I tried a season of Easyboots when competing on rough terrains. That was the most expensive experience I ever had with this horse. The first competition on bad terrain, every boot was shredded to bit within 15 miles. So, I decided I needed to try different styles of the boots. 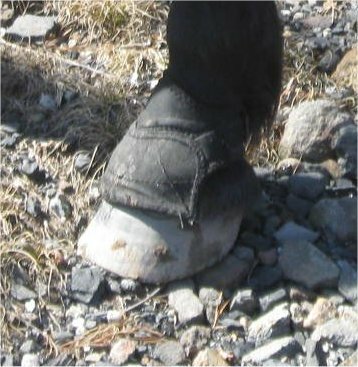 Easy boot has several different boots available to fit most hooves. I tried Gloves, Bares, Epics …. and every one was literally shredded by Flame on our conditioning rides. The manufacturer would not honor their warranty as they stated I was “misusing” the boots. Huh? So much for the Gloves, let’s try Epics next. So, in the fall of 2011, financially broke from buying boots and determined to find out if she would hold up to distance work totally barefoot, I put her on the most rugged terrain I could find in my area, for 32 miles, working at speeds in excess of 10 mph, and completed that training ride with sound and healthy feet. No chipping, no bruising, no problem. We will continue to condition on the roughest terrain I can find this winter, 2011 so that in 2012, no matter what trail we compete on, we will have the perfect feet! 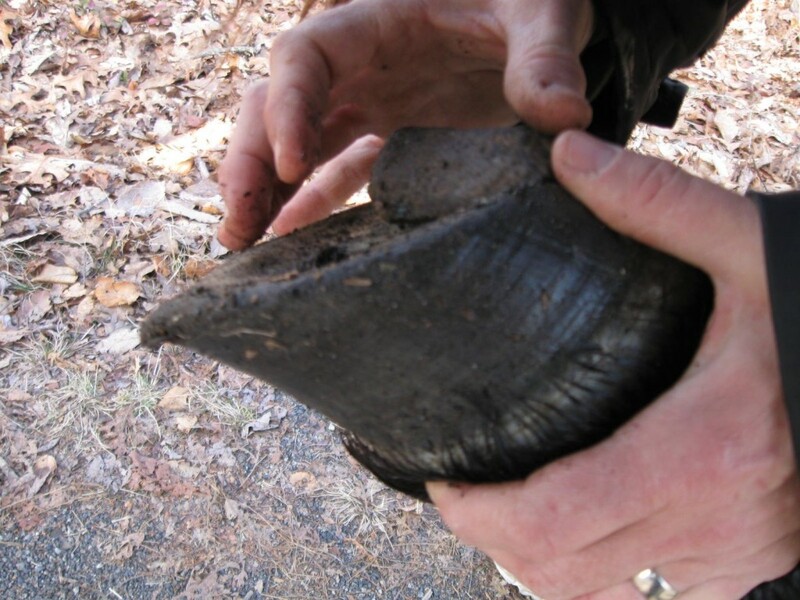 I have to share this picture … New Year’s Day 2012 … we were busting out a 15 mile ride on some really rough and rocky terrain and Flame got a rock wedged in her heel. Popped it out, look at the foot, not a chip to be found. We finished the ride with no after affects from the wedgie she got! Click this image to enlarge and see how nicely shaped her foot is.